On Saturday millions of people got active in order to clean up parks, beaches, public places, streets, and other areas. And The Universal Sea was with them! 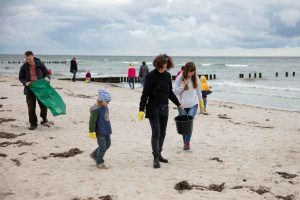 Not only in Berlin but also in Warnemünde, where our partner EUCC-D co-organised a Cleanup Day event on the coast. There was a great turn out in Warnemünde on the occasion of the #coastalcleanupday and #plasticattackday 2018. About 40 kilos of beach rubbish was collected by roughly 60 hardworking volunteers in just an hour and a half. Our creative lead Nicole Loeser was on-site and helped to achieve this great result. The Bye Bye Plastik demonstration in Berlin organised by Civil Integrity also had a great crowd show up to make a stand against plastic pollution on #CleanUpDay. ← Previous Previous post: Tomorrow is World Cleanup Day + Plastic Attack Day!